Laughter has uses aside from its well known medicinal properties it seems, including functioning as a game controller apparently. If I made a list of things that I wished my PS3 could do, having it watch me would have been conspicuously absent. 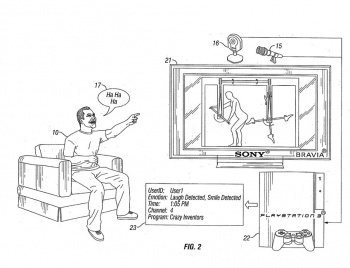 Sony has other ideas however, as a new patent filed by SCEA details a system that allows your PS3 to detect when you're laughing by listening and watching for audio-visual clues, which the patent dubs 'metadata'. It's not just laughter of course; the system can detect other emotions as well, by keeping track of this metadata. People not feeling your presentation? This system will pick it up and show you not only where you started losing people, but who you lost as well. This sounds great if you're in marketing, but like the Wii Vitality Sensor, it's hard to see what use it's going to be in games. It'd make a fantastic addition to RPGs, enabling the same kind of character interaction that Microsoft showed off with Natal and Milo, but beyond that it doesn't seem to include any other form of interactivity beyond just keeping track of your emotional state. Of course, there's the possibility that this is just a concept, rather than a commercial product that Sony is developing, in which case, disregard the preceding paragraph.